For quantitative determination of total antioxidant capacity (TAC) and evaluation of drug effects on TAC metabolism. • Sensitive and accurate. Use 20 μL sample. 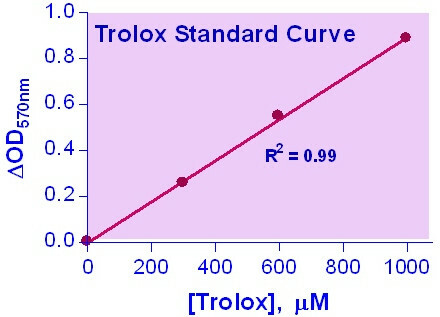 Linear detection range from 1.5 to 1000 μM Trolox equivalents. • Simple and high-throughput. The procedure involves addition of a single working reagent and incubation for 10 min. Can be readily automated as a high-throughput assay for thousands of samples per day. An ANTIOXIDANT is a molecule capable of slowing or preventing the oxidation of other molecules. Antioxidants protect the cells from damages by reactive oxygen species which are produced in oxidation reactions in the cell. Antioxidants can be small molecules such as glutathione, vitamins, or macromolecules such as catalase, glutathione peroxidase. As oxidative stress contributes to the development of many diseases including Alzheimer’s disease, Parkinson’s disease, diabetes, rheumatoid arthritis and neurodegeneration, the use of antioxidants in pharmacology is intensively studied. Antioxidants are also widely used as dietary supplements and in industry as preservatives in food, cosmetics, rubber and gasoline. Simple, direct and high-throughput assays for total antioxidant capacity (TAC) find wide applications in research, food industry and drug discovery. BioAssay Systems’ improved assay measures total antioxidant capacity in which Cu2+ is reduced by antioxidant to Cu+. The resulting Cu+specifically forms a colored complex with a dye reagent. The color intensity at 570nm is proportional to TAC in the sample. Applications For quantitative determination of total antioxidant capacity (TAC) and evaluation of drug effects on TAC metabolism. References Assay: Antioxidant in Plant Pomegranate juice (Pubmed). 2. Had?ovi -D?uvo, A et al (2011). Serum total antioxidant capacity in patients with multiple sclerosis. Bosnian Journal of Basic Medical Sciences 11(1):33-36. Assay: Antioxidant in Human Serum (Pubmed). 3. Hany, ML et al (2010). The Role of Oxidative Stress Markers and Nitric Oxide Levels in the Pathogenesis of Glaucoma. Australian Journal of Basic and Applied Sciences 4(8):3553-3558. Assay: Antioxidant in Human Plasma (Pubmed). 4. Labib, HM et al (2010). The Role of Oxidative Stress Markers and Nitric Oxide Levels in the Pathogenesis of Glaucoma. Austr. J. Basic and Applied Sci 4(8): 3553-3558. Assay: Antioxidant in Human blood (Pubmed). 5. Olaibi, OK et al (2014). Histological and Histomorphometric studies of ethanol-injured pylorus and duodenum of Wistar rats pre-treated with Moringa oliefera extract. Al Am een J Med Sci. 7(2):104-111. 6. Hegazi, RM and Kamel HFM (2014). Oxidant Hepatic & /or Haem. Injury on Fuel-Station Workers Exposed to Benzene Vapor, Possible Protection of Antioxidants. American Journal of Medicine and Medical Sciences 4(2): 35-46. 7. Hisser, MRN et al (2015). A 16-week study to compare the effect of vildagliptin versus gliclazide on postprandial lipoprotein concentrations and oxidative stress in patients with type 2 diabetes inadequately controlled with metformin monotherapy. Diabetol Metab Syndr. 11;7:62. Assay: Serum in Humans (Pubmed). 8. Madrigal-Bujaidar, E et al (2015). Hepatoprotective effect of Geranium schiedeanum against ethanol toxicity during liver regeneration. World J Gastroenterology. 21(25): 7718?7729. Assay: Liver cells in Wistar Rats (Pubmed). 9. Ijomone, OM, Olaibi, OK, Nwoha, PU, (2014). Effects of chronic nicotine administration on body weight, food intake and nitric oxide concentration in female and male rats. Pathophysiology. 21:185?190. Assay: Serum in Wistar Rats (Pubmed). 1. Fawole, O et al (2011). Chemical and Phytochemical Properties and Antioxidant Activities of Three Pomegranate Cultivars Grown in South Africa. Food and Bioprocess Technology:1-7. Assay: Antioxidant in Plant Pomegranate juice (Pubmed).